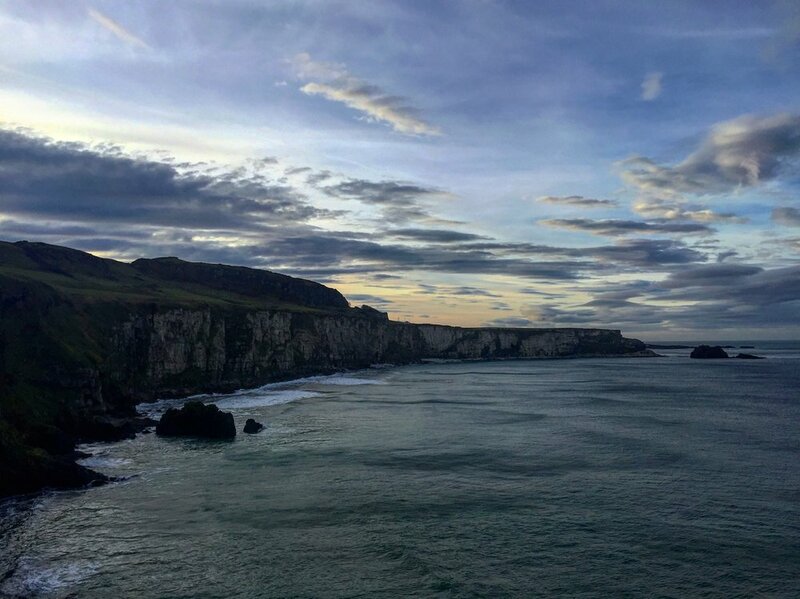 After the adventure around the Giant's Causeway, we headed east along our world-famous coastline and in just twenty minutes were pulling into the car park of another Northern Ireland icon - the rope bridge at Carrick-a-rede. 'Carrick-a-rede (from the Scottish Gaelic Carraig-a-Rade) translates as 'rock in the road'...the rock being the island and the road being the sea route for Atlantic salmon on their westward journey...for over 350 years, fishermen have strung a rope bridge from the mainland over to the island'. And now a quick heads up. With our country's growing popularity with worldwide tourists, coaches and cars whiz among Northern Ireland's hot spots all week long - so in the summer time expect to see a busy car park and possibly a queue for the bridge. If this turns out to be the case when you're there - no worries - make a thing of it and sit back for some great people watching! In the pics below you'll see that we were quite lucky the day we were there - it was the middle of winter, so not many around, plus the sun was shining and skies were blue. Sweet to the beat. The 10-minute walk from the car park to the bridge is stunning. Make it a 20-minute walk though and check out the various little outcrops and view points, especially looking back to where you came from - the white cliffs are awesome. 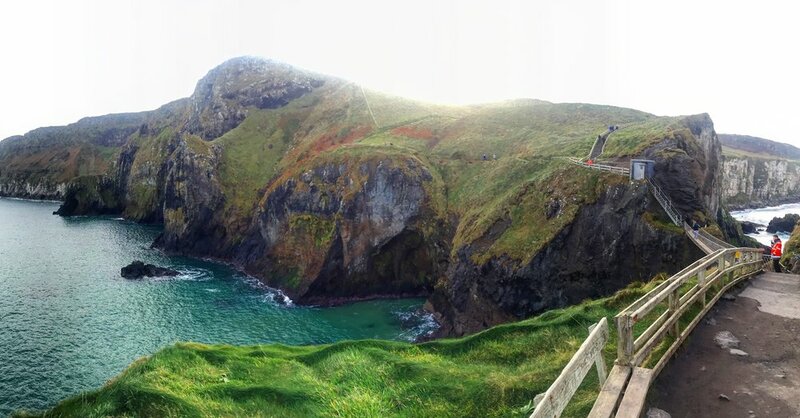 We actually need to go back and explore this area more another time - you'll recognise the disused Larrybane Quarry from season two of Game of Thrones - so try leave time to explore that on your Carrick-a-rede adventure. Onward to the bridge. In terms of difficulty, it's worth flagging the short burst of rocky steps near the beginning - other than that, it's a gentle stroll along a stone path with a wooden fence to deter anyone from going too close to the cliff edge. OK, so that was the easy part. The 1km long stone path ends with a descent of around 30 short steps, bringing you to the bridge's 'gate', where a friendly member of the National Trust NI will keep you safe and let you know when it's safe to venture across. While the experience of walking over the 20m long, bouncy bridge is fantastic, the views when over on the other side are even better. Zoom in on the pic below, you'll see the steep steps I talk about above. Despite the short walk, the pathway still gave us some EPIC views looking back to the mainland. Time was against us, with the winter sun going down - it's definitely worthwhile bringing some food and drink just to sit and chill to the sound of the big waves crashing below. By this time, we had totally expected the sun to be well gone, so parked our butts for a bit and refuelled on some Lindt chocolate and tea. 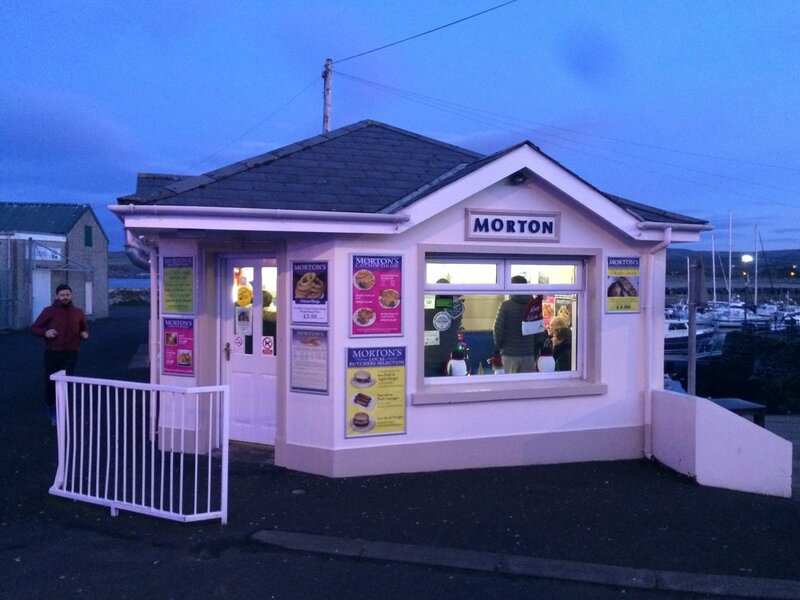 With all that sea air at Portbradden, the Giant's Causeway and Carrick-a-rede, plus the local wildlife stopping by to say hello, it was only right we finished off the day with a stop in Ballycastle for some fish and chips at the famous Morton's Chippy. On top of the cracker views around the harbour behind them, the Antrim coastline and on a good day, Scotland in the distance, these guys catch their fish locally each morning and were recently voted as having the best chips in NI! In the battle of hunger versus some taking some food pics....the belly won. Just take my word - go there.